Neomortonia is a genus which formerly contained two very different species. Both are epiphytic or saxicolous herbs with slender, pendent, repent, or scrambling stems up to 1 m long. They grow on damp, shady rocks or epiphytically on trees in lowland or montane forests. The flowers, however, were completely different. 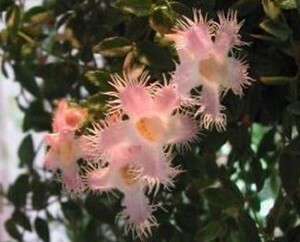 N. rosea has dramatic pink and frilled episcioid flowers, indicating pollination by euglossine bees. A possible second species, N. alba, is likely a white variant of N. rosea.